I love to cook and I’m excited to share what a typical experience in the kitchen looks like with me at the helm. I very rarely get to cook with total concentration. My sidekick is a real baby and usually demands attention at the worst possible moment. I’m far from being an amazing cook, but what I lack in talent I more than make up for in enthusiasm. I hope I can encourage anyone who has doubts about their cooking abilities! On Thursday I decided to cook a new dish. I had a bunch of random ingredients I wanted to use up–previously purchased canned white beans and pickled jalapeños for a recipe I never ended up making, chicken thighs, and three leftover leaves of rainbow chard. I did a quick Google search, and came up with this White Chicken Chili. I love Pioneer Woman recipes, they’re unfussy and homey which is just my speed. I don’t follow recipes to the letter, and usually the results I get are pretty good even if the dish doesn’t resemble the original perfectly. 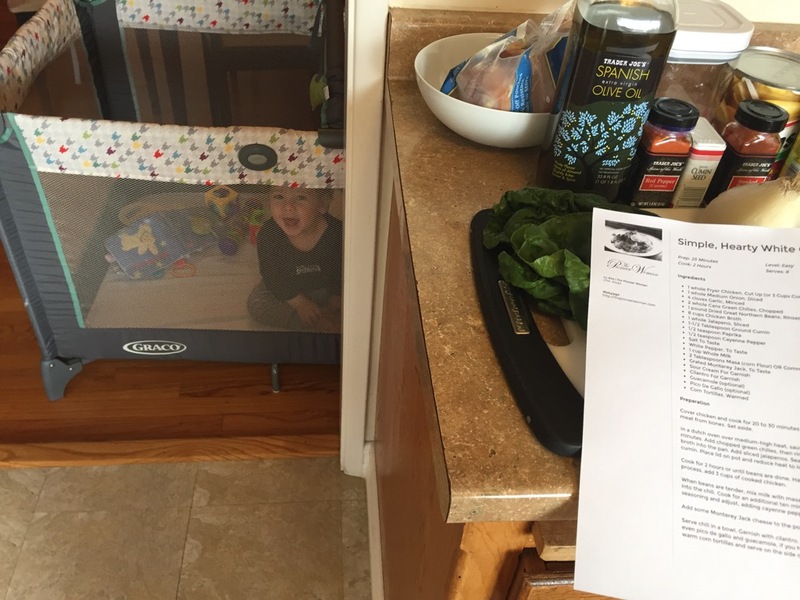 I put Rory in the Pack n Play and gathered all the ingredients on my kitchen counter. I pan cooked my chicken because it’s faster than boiling it. I only had half an onion, but it was plenty. 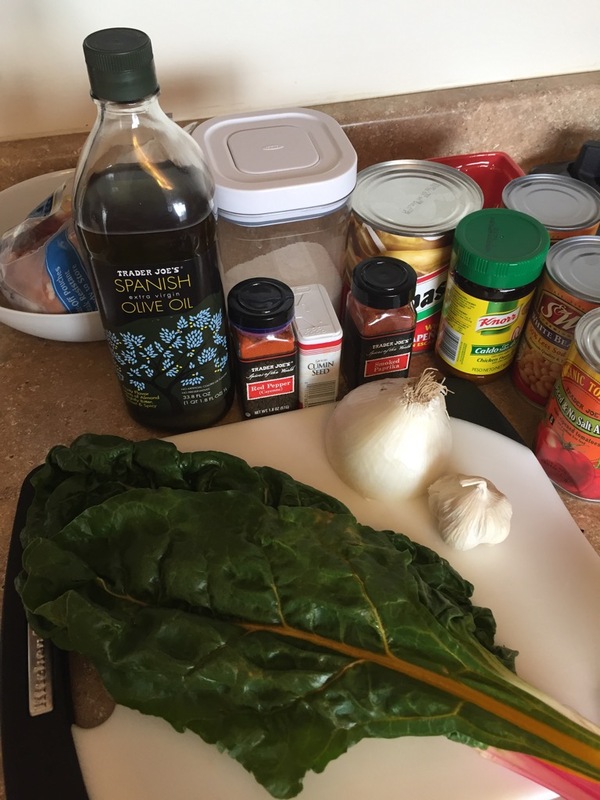 I really like to add veggies into recipes when I can, and rainbow chard is a favorite of mine to incorporate into just about anything–try it in your taco meat, meatloaf, or spaghetti sauce. I chopped up three large leaves and added them in after I sautéed the onions and garlic. I didn’t have any chicken broth on hand, so I used plain water and chicken bullion. I skipped the green chiles and used a can of diced tomatoes and a pickled jalapeño. The heat was just right with one jalapeño, but it could certainly be adjusted by adding a half to start or leaving out the seeds entirely. It would also work to use a fresh jalapeño instead. As usual, my son was content to play for the first ten minutes and started crying about the time the chicken fat was sizzling in the pan. I used canned beans rather than dried beans, which drastically cut down on the cooking time. I realized after I’d already added six cups of liquid that I probably didn’t need to add so much since my beans were already cooked. In my haste, I turned chili into soup. Once I realized I wasn’t going to get that thick chili consistency, I tasted the broth before adding anything else. I opted for only 1 and 1/2 teaspoons of cumin powder, and after several more spoonfuls, I decided the soup didn’t need any other seasoning. The bullion was plenty salty, and the pickled jalapeño gave it enough spice and acid. I think the soup tasted great and so did my husband. 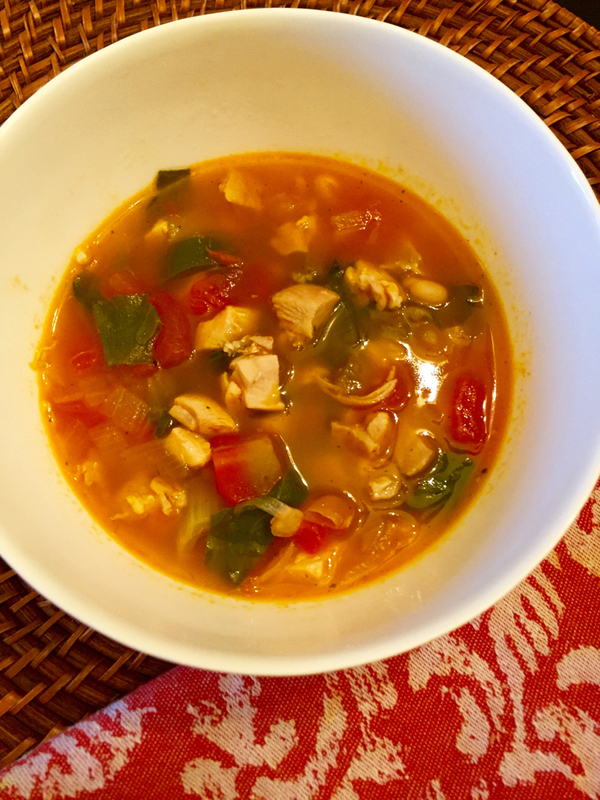 The distinct flavors of this caldo reminded me so much of Albondigas soup or Mexican rice. It was the perfect spicy soup for a gray spring day. I was too hangry to get a better photo. Some bread or corn tortillas would have been a nice addition, but sometimes it’s just more important to get dinner on the table than worry about all the things you’re missing. We had leftover soup on Saturday and served it with ciabatta from our neighborhood bakery. This recipe made a large pot, about 6-8 generous servings, and from start to finish took me less than an hour to make. I froze a couple portions for a future dinner (yay! ), and there’s still some left in the fridge. This is a perfect family-sized weekday meal that could also be adapted for the slow cooker. Boil or pan cook chicken. Remove from bones. Shred or chop into bite sized pieces. Set aside. In a large pot over medium-high heat, sauté onions and garlic in olive oil for 1 minute. Add chopped rainbow chard and mix to combine. Cook until chard is wilted, about 1 minute. Add the tomatoes plus juice, diced jalapeño, beans, chicken and chicken broth or water and bullion. Season with cumin. Place lid on pot and bring to a slow boil. Reduce heat to low. Taste soup and adjust seasoning. Add salt and pepper or add more jalapeño and cumin. If a less salty broth is desired, add more water. Serve in bowls. Warm corn tortillas or crusty bread on the side are a nice addition. I’m gonna print this out and keep it on hand, it will be perfect for fall in New England!